﻿ Health chief's words of wisdom: Wash your nails before being crucified! Health chief’s words of wisdom: Wash your nails before being crucified! Penitents at the Cutud Lenten Rights in San Fernando, Pampanga. The Department of Health has urged those planning to have themselves crucified this Easter to make sure their whips and nails are clean and sterilised. In a radio interview today (Friday, April 12) DOH Undersecretary Enrique Domingo said: “What is scary is tetanus. The penitent’s wounds — especially those who are going to be crucified — might get infected. Apart from washing wounds with soap and clean water, Domingo said they should also be dressed with antiseptics. 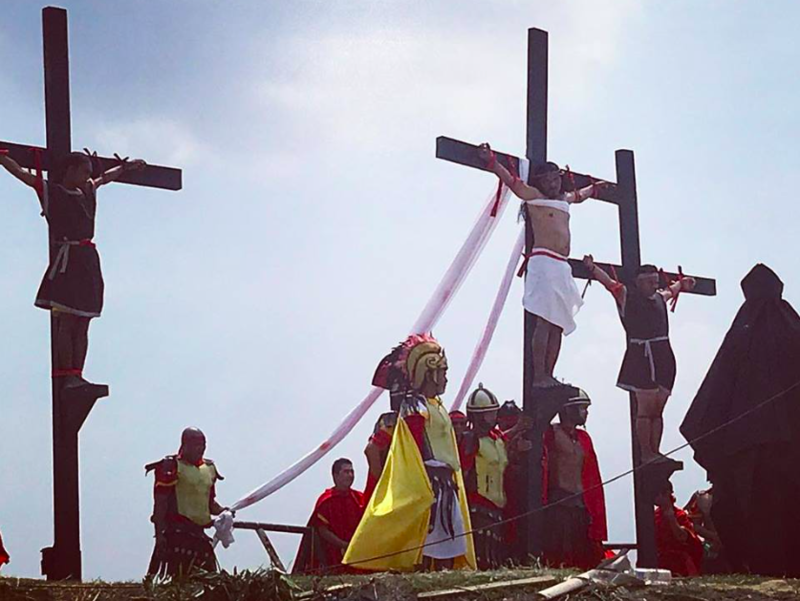 Pointing out that the flagellation and crucifixion are performed during the hottest hours of the day, Domingo said bleeding and dehydration could cause “too much stress” on the body. In the same interview Domingo also issued a reminder for children and the elderly not to stay outdoors between 10am and 4pm “to avoid overheating the body”. Temperatures in the country have risen to as high as 39 degrees Celsius. This week, the heat index — the temperature as felt by the human body — in Dagupan City, Pangasinan, reached 51.7 degrees Celsius. “When our body perspires, we get dehydrated and the water in our body gets depleted. Thus, we need to keep replenishing the fluid in our body,” he said. It is utterly irresponsible for Roman Catholic officials to not speak out loudly and repeatedly against this dangerous, foolish, and useless practice. 1) The article refers to “penitent” (a person who repents of sin), but being nailed to a cross is very different from repenting. Some of these ignorant people live in notorious sin before and after their public displays of fake religiosity. 2) These “crucifixions” are very different from what the Lord Jesus was subjected to. If they’re only going to do it halfway, they shouldn’t bother with it at all. 3) The so-called penitents say they are trying to pay for their sins. This is either tremendous hubris, or incredible ignorance, or both. Only what Jesus did on his cross can wash away our guilt, because Jesus never sinned. He is the perfect sacrifice for our sins. Anyone casually reading pretty much any book in the New Testament can figure that out. Again, Rome needs to forcefully address this pageant of purposeless pain, because these pain-itents are misguided Catholics.